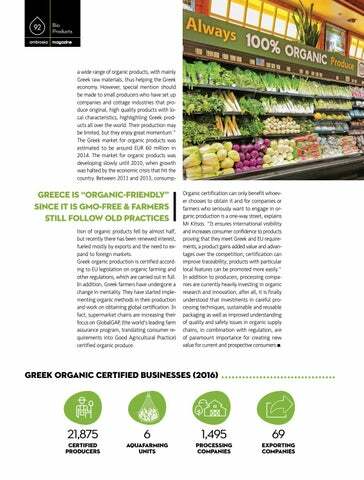 Greece is “organic-friendly” since it is GMO-free & farmers still follow old practices tion of organic products fell by almost half, but recently there has been renewed interest, fueled mostly by exports and the need to expand to foreign markets. Greek organic production is certified according to EU legislation on organic farming and other regulations, which are carried out in full. In addition, Greek farmers have undergone a change in mentality. They have started implementing organic methods in their production and work on obtaining global certification. In fact, supermarket chains are increasing their focus on GlobalGAP, (the world's leading farm assurance program, translating consumer requirements into Good Agricultural Practice) certified organic produce. Organic certification can only benefit whoever chooses to obtain it and for companies or farmers who seriously want to engage in organic production is a one-way street, explains Mr Kitsos. 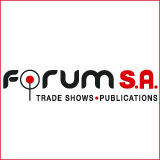 “It ensures international visibility and increases consumer confidence to products proving that they meet Greek and EU requirements; a product gains added value and advantages over the competition; certification can improve traceability; products with particular local features can be promoted more easily.” In addition to producers, processing companies are currently heavily investing in organic research and innovation; after all, it is finally understood that investments in careful processing techniques, sustainable and reusable packaging as well as improved understanding of quality and safety issues in organic supply chains, in combination with regulation, are of paramount importance for creating new value for current and prospective consumers n.